Kid ‘n Play is an American hip-hop act from New York City that was popular in the late 1980s and early 1990s. The duo was composed of Christopher Reid (born April 5, 1964) and Christopher Martin (born July 10, 1962) working alongside their DJ, Mark “DJ Wiz” Eastmond. Besides their successful musical careers, they are also notable for branching out into acting. The pair met while performing in rival high school groups The Turnout Brothers and The Super Lovers, and initially formed their duo under the name The Fresh Force Crew. In 1986 She’s a Skeezer and Rock Me were recorded. By 1987 they had changed their name to Kid ‘n Play. 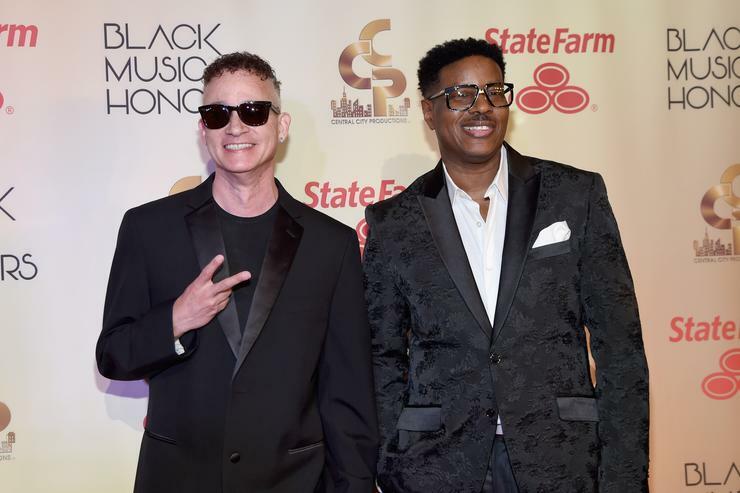 Kid ‘n Play recorded three albums together between 1988 and 1991: 2 Hype (1988), Kid ‘n Play’s Funhouse (1990), and Face the Nation (1991). Hurby “Luv Bug” Azor, the producer for Salt-n-Pepa (who had been a member of The Super Lovers with Play) served as Kid ‘n Play’s manager and producer during the early portion of their career. All three albums focused upon positive lyrics backed by pop-friendly instrumental tracks. Among the group’s most successful singles were 1989’s “Rollin’ with Kid ‘n Play” (#11 on the Billboard R&B singles chart), 1990s “Funhouse” (#1 on the Billboard rap singles chart), and “Ain’t Gonna Hurt Nobody” (another #1 rap hit). The group’s stage show highlighted their teen-friendly personalities, and dances such as their trademark, the Kick Step. Kid’s visual trademark was his hi-top fade haircut, which stood ten inches high at its peak. Martin regularly wore eight-ball jackets. Kid ‘n Play were also notable for their dance known as the Kid n’ Play Kickstep, first seen in their video “Do This My Way,” and described in the song “Do the Kid n’ Play Kickstep,” from their first album, 2 Hype. Also affectionately known as the “Funky Charleston,” it was influenced by the 1920s era dance The Charleston. The Kid n’ Play Kickstep featured the new jack swing-aerobic dance moves typical of late 1980s urban street dancing. Unlike the original Charleston, The Kid n’ Play Kickstep requires two participants instead of one. This dance also was made quite popular in Kid ‘n Play’s feature film House Party, in which Kid and Play have a dance competition with Tisha Campbell and A.J. Johnson.